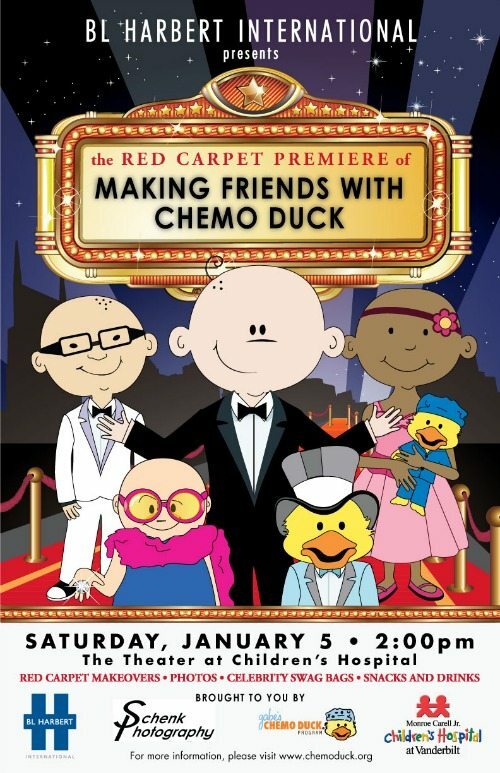 Nashville, Tenn. – Gabe’s Chemo Duck Program®, a nonprofit organization providing education and comfort to children with cancer, will host a red carpet event featuring the new Chemo Duck cartoon on Saturday, Jan. 5, from 2 to 4 p.m. at Monroe Carell Jr. Children’s Hospital at Vanderbilt for their former and current pediatric cancer patients. The event, presented by BL Harbert International, is free and will feature red carpet makeovers, pictures, celebrity goody bags, snacks and more! Guests are required to RSVP with the number of children in their party by emailing info@chemoduck.org or calling (615) 830-0126. The “Making Friends with Chemo Duck” cartoon was created to help teach children about chemotherapy and to provide comfort in a child-friendly manner. The video sheds light on some of the struggles children go through and reiterates the fact that they haven’t done anything wrong and that they are still the same kid on the inside. The cartoon appeals to children of all ages and helps them understand that they are not alone.